Nothing ever happens to Henry Huggins. Nothing, that is, until a stray dog named Ribsy comes into his life. 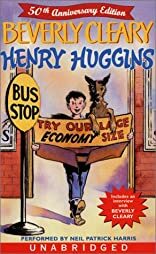 Pretty soon, Henry and Ribsy are wreaking havoc on the city bus, getting a ride in a police car with sirens wailing, and winning a prize at the dog show. Thanks to their joint shenanigans, Henry finds himself covered in green paint one day, and later accidentally colors Ribsy's fur pale pink. One week, Henry catches earthworms for his fisherman neighbor to raise money for a borrowed ball Ribsy helped him lose. One football costs a lot of earthworms--1,395, to be exact. Plus 41 worms for tax. Life is no longer dull. 6/11/2009 TS Rogers said: Amongst the first books I read to myself.